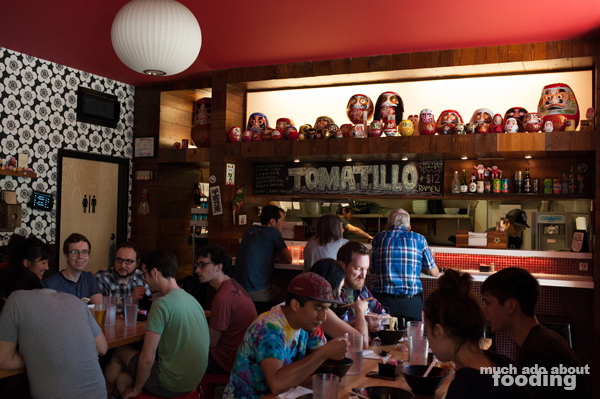 A hot afternoon walking around downtown Austin somehow made us crave ramen. It's odd - hot noodle soups seem to be good in any weather. Daruma on 6th Street happened to be on my list of places to check out, particularly because they are a ramen shop that has a less common type of method to their dishes. With so many versions of ramen in Japan itself, it's always interesting to see which types of prevailed in America; any time I see a restaurant touting variety, I'm curious to see how it turns out. 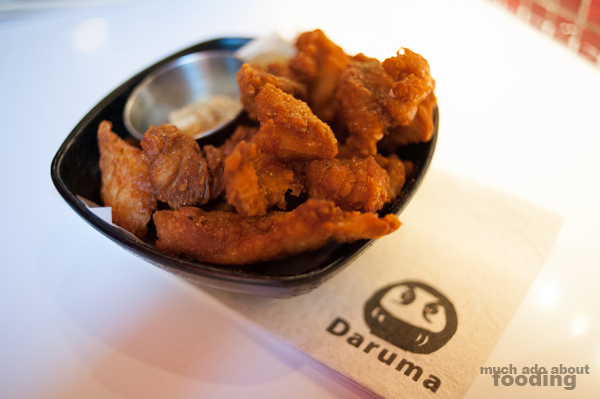 For the hot day we were experiencing when we popped into Daruma, their base was ideal. 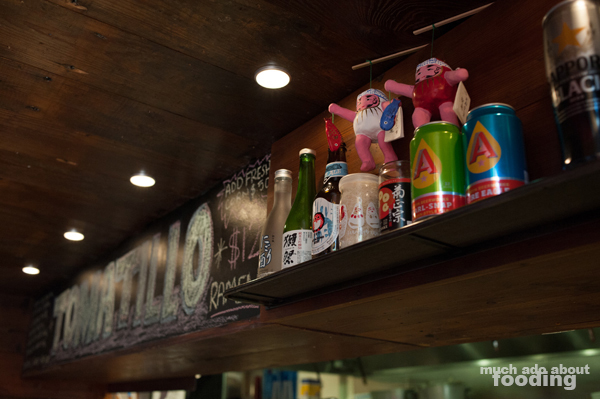 The inside of this restaurant is quite cozy, as is the case with most ramen shops. The bar seating allowed diners, ourselves included, to watch the cooks make up the dishes as orders were placed. 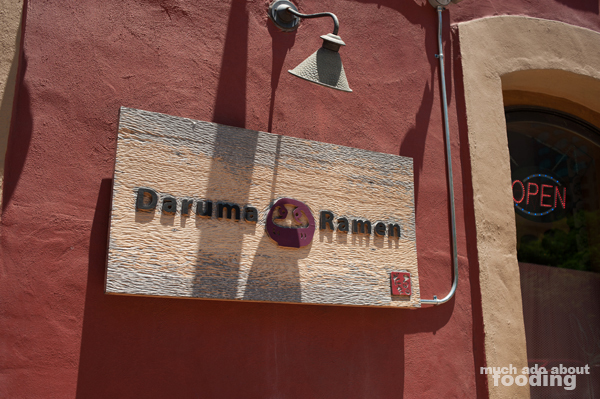 What makes Daruma a little different from other ramen spots was that their specialty was in ramen made with whole chicken broth and accompanied by eggless, tapioca-based noodles. Most commonly, we see pork bone bases for broths and iconic yellow flour noodles so this was a change of pace. 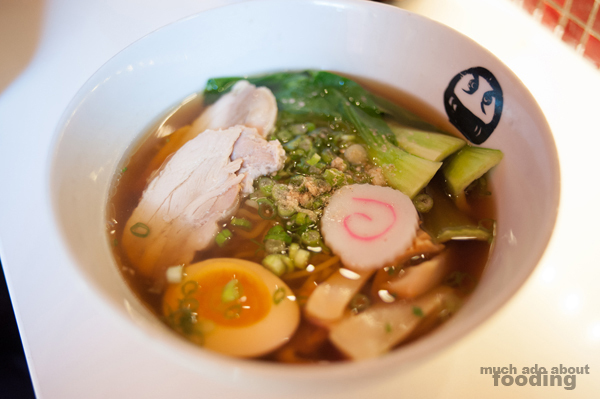 They boast making their bases and stock every day, and their menu focuses on the lightness of the broth. Ordering is made simple by giving diners just a handful of choices. Four options of ramen, actually. There are few sides as well, and the only dessert you can get is some ice cream. How's that for making your decisions easier? We eyed and ordered the Tatsuta-age ($5.50 - fried chicken thighs) to start, knowing that a place focused on chicken broth should know how to make a chicken appetizer. Did they? Absolutely. The bite-sized pieces had the right amount of crunch to them and seasoning, not even needing the thick dipping sauce they came with (though that was tasty as well). We would have ordered a second round of this had we not seen how sizable the ramen bowls were. I went for the Shoyu ($10 - chicken-chashu, aji-tamago, bok choy, scallions, menma, naruto, sesame, and anchovy oil) and Duc for the Miso ($10 - miso base + chicken broth; shredded chicken breast, aji-tamago, bean sprouts, scallions, chili threads, chili oil). Both came out warm enough but not the steaming hot they ought to have been. The broth was visibly light for both so we were excited to see what flavors a chicken-based broth would impart on the rest of the whole dish. My chicken chashu was a fantastic change-up from the typical pork chashu; it looked to be compressed moist chicken leg that had been thickly sliced and salted. In both cases, the aji-tamago (soft-boiled egg) had a great runny yolk but was lighter in flavor than preferred; perhaps they were done so to not overwhelm the delicate broth. Because the stock was less fatty than pork-based stocks, we had to pay closer attention to the nuances of the base which was slightly sweet, light-bodied, and certainly built to express the other ingredients per bowl. 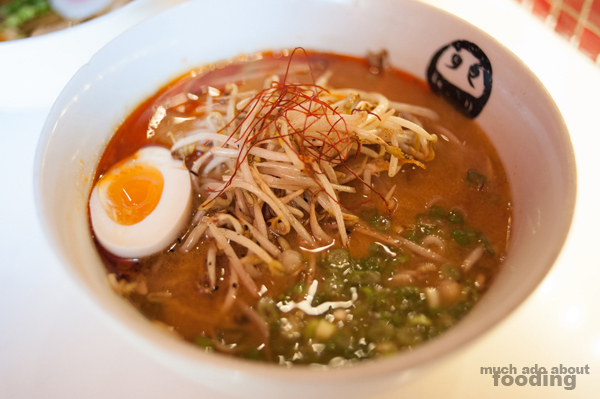 Overall, certainly a style befitting of those wanting their ramen without all of the fat! 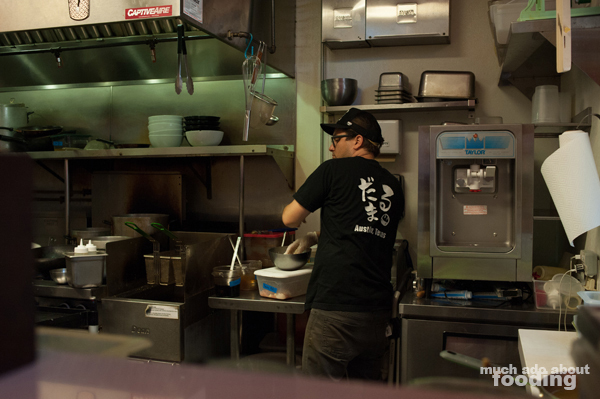 You can find Daruma Ramen at 612 E 6th Street, Austin, TX 78701 in downtown Austin. I'd think that a chicken-based broth would make this the perfect spot to go to if you're also feeling under the weather but want something more fun than just plain chicken soup. Photos by Duc Duong. More photos available on Facebook here.